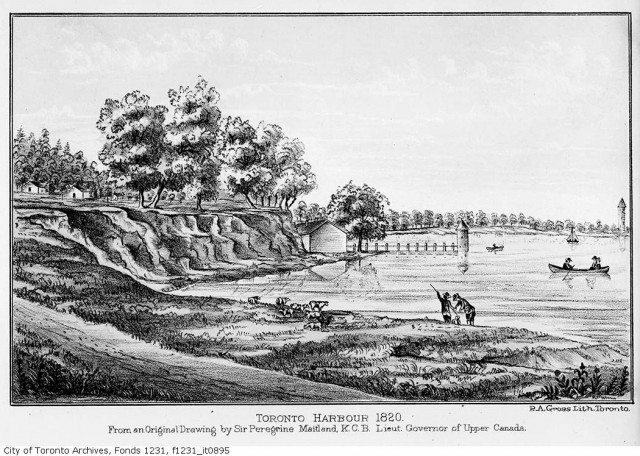 Toronto Harbour as it looked in 1820. Givins would already have lived in Toronto for decades and seen many changes in the town. The smash hit Broadway musical Hamilton has made the founding fathers and the American Revolution hot topics. Well surely Colonel James Givins, who died 170 years ago this month, is turning in his grave at the news that Alexander Hamilton and his revolutionary cohort are cool again. Givins fought in the American Revolution, or American War of Independence—but on the British side. He settled in Canada, likely no longer welcome in the new United States, and served as an Indian agent, and fought for the redcoats again in the War of 1812 at the Battle of York. He died at 87 in 1846 and has a street (and school) named after him. Where Givins is from exactly is a bit hazy. He was possibly born in Ireland, because John Graves Simcoe, lieutenant-general of Upper Canada, once said Givins was “bred up” by Henry Hamilton, who was Irish. Givins was with Hamilton when he was posted as lieutenant-governor of Detroit in 1775. While in Detroit, Givins learned to speak the Ojibwe language (Anishinaabemowin), which would be an asset later in life when he worked with Ojibwe communities in southern Ontario. He helped take Fort Sackville at Vincennes, Indiana in 1778, but became a prisoner of war when the American forces re-took the fort in 1779, when they renamed it Fort Patrick Henry. 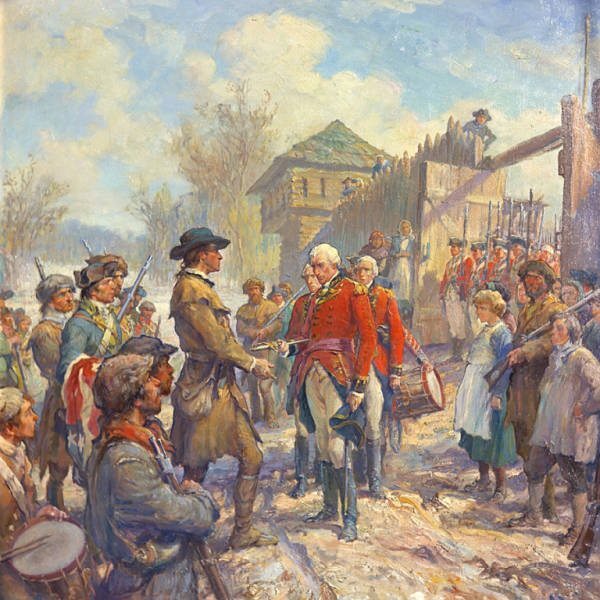 Henry Hamilton surrendering Fort Sackville to American forces in 1779. He and Givins were both prisoners of war following the fall of Fort Sackville. Painting by Frederick C. Yohn. After his release in 1781, he disappears from the record for a decade before reappearing in November 1791 as the newly appointed lieutenant for the Queen’s Rangers. The group, commonly called “Simcoe’s Rangers” during the American Revolution, needed a new leader because John Graves Simcoe had just been appointed the lieutenant-governor of Upper Canada. Under Simcoe and Givins, the Rangers helped build Fort York and Yonge and Dundas Streets. In 1797, Givins married Angelica Andrews and became the Indian Agent for Upper Canada. He and Andrews would go on to have nine children. In his work as Indian agent, Givins was in charge of overseeing the annual present-giving ceremony, which he was instructed to hold separately for the Mississaugas and the Six Nations so that the two groups would not have much opportunity to to come to “any Junction or good understanding between these two Tribes,” in the words of colonial administrator Peter Russell. Russell was worried because 1797 was a tense time in the relationship between the British settlers and the indigenous population. Wabakinine, a Mississauga chief who was friendly with the British, had been murdered by a Queen’s Ranger the year before and the Six Nations, under the leadership of Joseph Brant (Thayendanegea) had been involved in a long dispute over the right to sell land. A sketch of the parliament buildings in York as they would have appeared in Givins’s day. City of Toronto Archives, Fonds 1231, Item 2076. Givins got his own parcel of land, 1,200 acres in total, as a thanks for his service for the loyalist side in the American Revolution, and he built his house, Pine Grove, in 1802 on 100 acres where Givins Street now runs. Givins/Shaw Junior Public School was named for the street and for nearby Shaw Street—named for Givins’s neighbour Aeneas Shaw. John Ross Robertson’s describes Pine Grove (which he visited in 1888) in his 1894 book Landmarks of Toronto, as “the oldest house in the city.” “A crescent shaped pathway leads to the front door,” Robertson writes, “with on either side a giant locust tree, each planted by Colonel James Givins.” Robertson goes on to describe the inhabitants and appearance of the old homestead, including, remarkably, bloodstains on the floor from the Battle of York. The Queen’s Rangers were disbanded in 1803, but Givins was back in the military within the decade as an aide-de-camp for Major-General Isaac Brock, the so-called “Hero of Upper Canada,” during the War of 1812. The Battle of York, a defeat for the British, was fought on April 27, 1813 and ended with York (now Toronto) being sacked—and men bleeding on Pine Grove’s floor. A 1914 painting of the arrival of the American fleet before the Battle of York. From the Toronto Reference Library, Owen Staples. That morning, American troops landed at York and Givins led a small troop of Mississaugas in the defence of the town and fort. Lieutenant-Governor Sir Roger Sheaffe noted Givins and co. for “spirited opposition.” It wouldn’t be enough, however, and the American forces, led by General Zebulon Pike, moved towards Fort York. British forces accidentally exploded the Western battery magazine, killing 20 men and causing confusion that allowed further American advance. After it was clear that the day was lost, Sheaffe retreated to Kingston and, without informing the militia or legislature, ordered the explosion of Fort York’s magazine. The explosion killed 38 Americans, including Pike, and injured over 200. Givins and his band had intercepted the Americans on their march from the lake to Fort York, but they were outnumbered (and presumably outgunned, outmanned, and outplanned) and retreated east to Pine Grove. At home, Angelica Givins stitched up the wounded men and removed musket balls from their injuries—hence the blood-stained floors. York was sacked that night and the parliament buildings were burned. British forces retaliated the following year and burned down the White House. 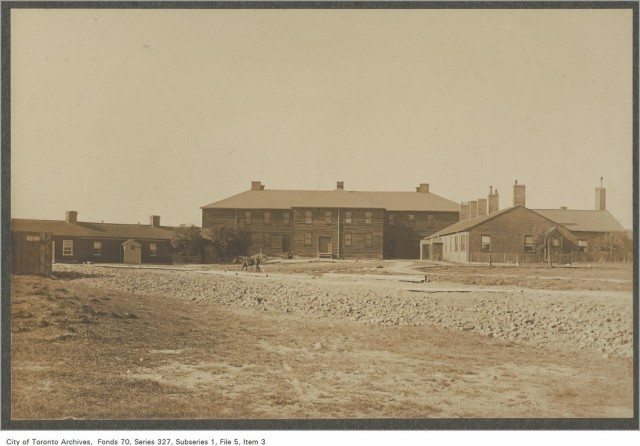 D Barracks at Fort York from the 1830s as they appeared around 1899. Toronto Archives. 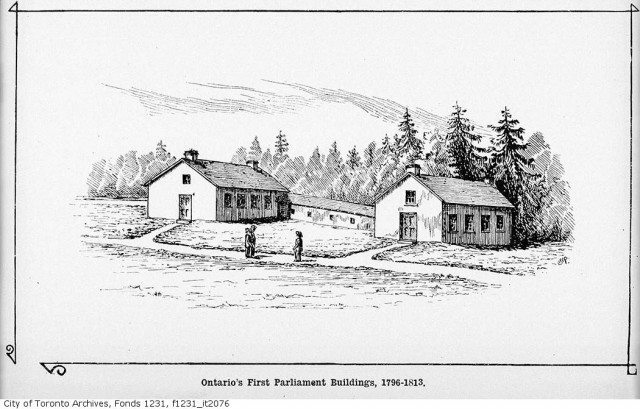 Givins went on to serve as Chief Superintendent of the Indian Department in Upper Canada from 1830-1837 and was nicknamed “the Wolf.” He was involved in supporting a project by the Mississaugas the Reverend Peter Jones to build a village of Christian converts—the Credit Mission—along the Credit River, which would later serve as the model for Canada’s reserve system. The village had largely declined by 1847 and many of the inhabitants returned to the Grand River reserve. CORRECTION: 2:20 PMA previous version of this story incorrectly stated that James Givins died 127 years ago. Torontoist regrets the error.